Ram Charan RC 10 to be Thani Oruvan Remake? Home/NEWS/Ram Charan RC 10 to be Thani Oruvan Remake? Ram Charan RC 10 to be Thani Oruvan Remake? What will happen to the movie with Surender Reddy. 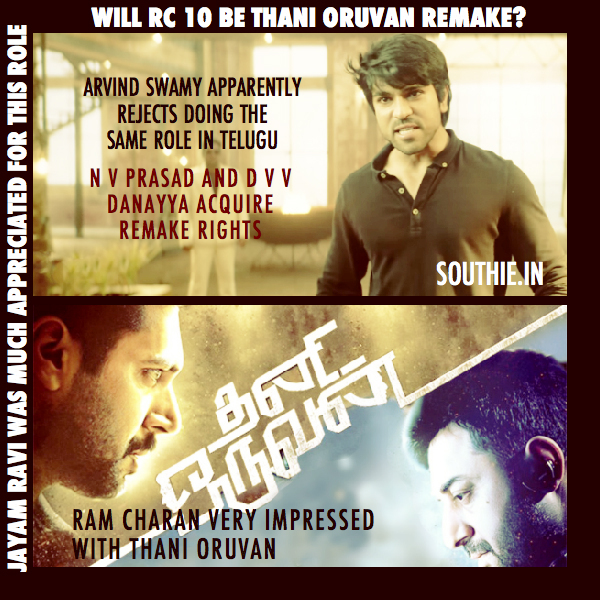 Ram Charan very keen on the remake of Thani Oruvan. NV Prasad and D.V.V.Danayya has bought the Telugu remake rights of the movie for a whopping Rs 5.5 Crores. According to latest update, the makers wanted to rope Aravind Swamy to play the role of antagonist but he rejected the offer to act in its remake, he does not want to repeat his performance. As Arvind Swamy doesn’t want to repeat his performance, will Rana replace him in Telugu. He would be a perfect choice for the Anti Hero. The makers seem to be considering Raga Daggubati to play the role of Arvind Swamy. According to makers Mega Hero and Rana will be perfect for these characters. The official confirmation is awaited on this matter. Mohan Raja who directed Tamil version, is very likely to direct the Telugu Version as well. Who will play the heroine opposite Ram Charan is to be seen as Shruti Haasan or Samantha would be ideal choices considering Shruti Haasan was only seen in an insignificant role in Yevadu and Samantha is yet to romance the Mega Powerstar. The makers have to see that the script is changed accordingly to suit the Telugu audience. There should be more entertaining factors and the movie should not have a dull feel to it.